Computer Science is the study of information and computation. It provides the increasingly important theoretical underpinnings and practical tools for constructing, analysing, and verifying the behaviour of a vast range of complex systems. Its methods now pervade everything from the biological sciences to the financial markets. It continues to evolve quickly, with many exciting breakthroughs inevitable in the next decade. Cambridge's Computer Science course is able to attract some of the best homegrown and international students. It also provides the flexibility necessary for each student to pursue their particular interests. The quality of our graduates is reflected in both the popularity of our annual recruitment fair and in the numbers who pursue further postgraduate study. In total, there are more than 30 Computer Scientists at St. John's College, including undergraduates, postgraduates, post-doctoral researchers and teaching staff. This strong community and the broad range of expertise it represents makes St John's an ideal place to study Computer Science. The College has a strong history in Computer Science: one Fellow , Professor Max Newman, worked on early computing technology at Bletchley Park; an esteemed former Fellow, Professor Sir Maurice Wilkes, built the first practical stored-program computer (called EDSAC) and was head of the Computer Laboratory for many years. 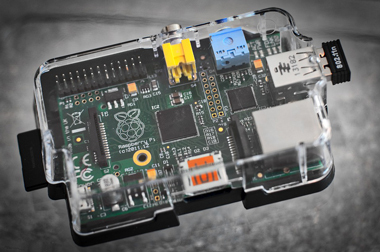 More recently, Johnians have been involved in developing the popular Raspberry Pi computer, designed to spark interest in computer science and electronics among school children. We currently have one Teaching Fellow in this subject, Dr Robert Mullins. Dr Mullins is assisted by other members of the College and by colleagues in the University Computer Laboratory. All the undergraduate rooms in College have connections to the College network, and hence the Internet. There is also a spacious computer room in the new library, as well as additional facilities in the Fisher Building. These facilities are open 24 hours a day and equipped with networked workstations that satisfy the computing needs of most members of the College. The College is conveniently situated in the centre of Cambridge towards the Computer Laboratory. Cambridge teaches the undergraduate Computer Science course over three years. The course is formally known as the Computer Science Tripos , and the three years as Part IA, Part IB, and Part II. An MPhil in Advanced Computer Science is also available. Part III / Year 4: The fourth year is designed for students who are thinking of a career in academic or industrial research. It explores issues at the forefront of Computer Science and provides the opportunity to complete a substantial research project. Those who successfully complete Part III graduate with the MEng qualification, as well as the BA degree attained at the end of Part II. Students are also able to graduate after three years, with a BA, should they choose to do so or should they not meet the academic standard for entry to Part III. The Computer Laboratory web pages provide complete details of the Cambridge Computer Science course. Mathematics at A2, or equivalent, is essential. Further Mathematics and a Physical Science is highly desirable, applicants who are able to take Further Mathematics at A2 or equivalent should do so. Mathematics at A2 is essential and we would expect candidates to have a strong mathematical ability. There is no requirement to have studied Computer Science at A-level, although it may be useful. We would in general prefer a candidate with an AS or A2 in Further Mathematics (if offered by your school). Further A-level requirements will depend on which first year option you wish to read, details can be found here. We also welcome applications from candidates taking other qualifications, e.g. the International Baccalaureate. If you are in any doubt about the suitability of your combination of subjects as a preparation for the Computer Sciences Tripos , please contact us. Those invited for interview will have two interviews: one with the Tutor handling you application and one with the Director of Studies for Computer Science. Each interview will last around 20 minutes. Interviews provide us an opportunity to explore your motivation, intellectual curiosity and aptitude for computer science. To help us do this, we normally ask you to tackle a number of problems to test your problem solving and analytical reasoning skills. We try to conduct our interviews in a friendly and informal manner, and you should not feel daunted by the prospect of them. Applicants who are interviewed in Cambridge will also be required to sit the CSAT at interview, more information on this test is available here. Additional useful information and a booklet for prospective students are provided by the Computer Laboratory. It is also a good idea to visit the Computer Laboratory on one of its open days. The visit includes a talk given by the Head of Teaching and a chance for visitors to meet current students and staff as they tour the department. It is also a chance to view demonstrations of student projects and research.